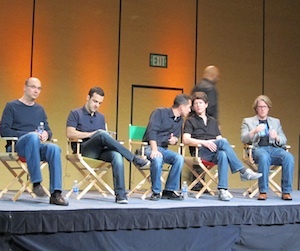 Today at their I/O conference in San Francisco, Google had a range of things to announce, many of them about Android. By far the most interesting thing to me was the notion that Google is finally getting their carrier and OEM partners in line with regard to Android updates. Well, that’s the plan anyway. The actual details are very thin at the moment. While Google announced this on stage at the event, Android head Andy Rubin and others elaborated on the new initiative later in a press briefing. Reaffirmed was the idea that partners would commit to delivering the latest Android updates to their devices for at least 18 months after their launch. But just how quickly will the updates come to those devices? That’s yet to be announced, and we should stay tuned for that information, Rubin said. When questions kept coming about the specifics of the initiative, Google finally admitted that much of this is still in the discussion phase with their partners. Rubin noted that it was vital that they get everyone to the table to discuss this before all the specifics were worked out. The first specific was the 18-month update commitment. “Over the next few weeks, we’ll figure it all out,” he said. Rubin stated that the problem is essentially a logistics one. There are over 300 different Android devices now from different OEMs running on different carriers around the world. “It’s pretty complex,” he said. “We’re not just building one product,” he continued, seemingly alluding to Apple’s iPhone, which has doesn’t share the update headaches that Android devies have. When my colleague Jason Kincaid asked why the carriers and OEMs care about the fragmentation given how quickly their Android products are growing, Google assured him that their partners do care about this because delivering the best consumer experience is paramount. Also: “there’s been a lot of articles by you guys,” Hugo Barra quipped. Later, my colleague Greg Kumparak asked about the skins that the OEMs like to customize and place on top of Android — this is often cited as a reason for hold ups in delivering new builds of Android. Google was more vague about that. Essentially, they’re still very open to the OEMs doing these skins if they prefer, but again, that’s likely to still be discussed when figuring out how quickly updates should come out. Still, if Google can actually get the partners to agree on favorable update terms, this should be a big win for Android users. The partner list Google unveiled today is impressive: Verizon, AT&T, T-Mobile, Sprint, Vodafone, Sony, Motorola, HTC, LG, and Samsung.